In contrast to surgical clipping, which results in immediate apposition of the intima surfaces across the aneurysmal neck, endovascular coiling induces a sequential intraaneurysmal cellular response to the coil material. The tissue response to endovascular coils is variable. Tenjin et al. (28) studied the temporal sequence of histopathological events induced by GDC placement on carotid artery aneurysms in primates. Thrombus formation occurred immediately after coil placement. Two weeks after placement, neoendothelialization of the orifice of the aneurysm was observed. At 3 mo a thick membrane resembling vascular media was covering this site. Ma wad et al. (29) showed similar results at 6 months in canine aneurysms treated with GDC. Fig. 2. Complete exclusion of an aneurysm from the circulation is not usually from the coil mass alone. An unruptured right middle cerebral artery (MCA) anterior temporal branch aneurysm before and 6 mo after coiling in a patient found to have multiple cerebral aneurysms after presenting with subarachnoid hemorrhage. The left and center panels are 2D angiograms with right internal carotid artery (ICA) injection. The 3D rendering in the right panel shows that the radiodense coil mass is separated from the contrast within the artery by a layer of radiolucent material probably representing fibrosis of the aneurysm neck. neck has been demonstrated as early as 36 h after coiling and has been suggested to serve as a substrate for endothelialization (30). 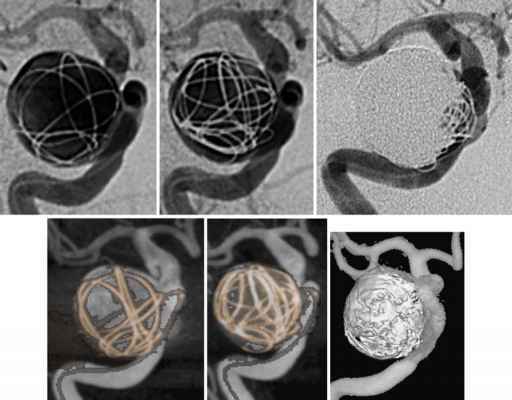 Complete isolation of the aneurysm from the parent vessel can promote scar formation and stabilization of the thrombus (Fig. 2). Ishihara et al. (31) showed endothelialization of platinum coils at the orifice of human cerebral aneurysms at 2 wk and at 20 mo after embolization in five cases of small neck aneurysms. Bavinzski et al. (32) studied the histopathological changes in 18 human cerebral aneurysms treated with GDC and concluded that endothelialization of the aneurysm orifice after coiling can occur but seems to be the exception rather than the rule. 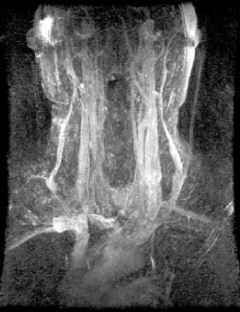 They found tiny gaps between the coils at the aneurysm neck in 50% of densely packed aneurysms that appeared completely occluded on angiography. Small neck size and dense coil packing across the aneurysm neck are important factors to induce endothelialization, which excludes the aneurysm from the parent vessel. Shimizu et al. (33) showed the presence of organized thrombus at the periphery of a small, broad-necked aneurysm 6 wk after loose coil application in the absence of neck neoendothelium. They suggested that this could provide reinforcement of the aneurysmal wall despite the absence of exclusion from the parent vessel.